Thomas Grimsley was born in Middleton Stoney, Oxfordshire in about 1800, according to his own calculations; but it seems likely that he was the infant of that name baptised at Middleton Stoney Church on 8 April 1798, the son of William & Mary Grimsley. He trained as a sculptor and terracotta maker in London. Rebecca Stockford was born in Duns Tew, Oxfordshire in 1796, the daughter of William Stockford and Mary Benham, and was baptised there on 28 August 1796. On 18 February 1822 at St Marylebone Church in London, Thomas Grimsley married Rebecca Stockford: they were both then living in that parish, and three people with the surname Brook were witnesses. Thomas was described as being of Middleton Stoney in his marriage announcement in the Historical Register of the New Monthly Magazine and Literary Journal published that year. Frederick Grimsley (born at the south end of St Giles’s Street, Oxford on 8 October 1837 and baptised at St Mary Magdalen Church on 11 February 1838). Grimsley’s address in Paddington was 18 Market Street, and he was described as a scagliola (artificial marble) manufacturer there in an insurance policy of 16 June 1830. Grimsley exhibited at the Royal Academy between 1827 and 1840, first from several addresses in the Edgware Road area and then from Oxford. In 1829 he received £220 for the six bell-shaped vases that still stand on the balustrade of Buckingham Palace. In 1830 he executed a bust of the Duke of Wellington at Stratfield Saye House in Hampshire, and in 1831 he showed a bust of George IV at the Royal Academy. The Grimsley family moved to Oxford in 1835 (between the baptism of Susannah in Paddington in June and the death of Hannah in Oxford in October), and Thomas is listed in the Oxford electoral polls book of 1837. 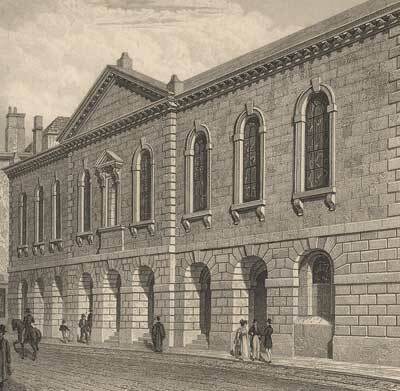 By the beginning of 1838 they were living at 76 St Giles’s Street in St Mary Magdalen parish, but they were soon forced to move from here, as this was one of the houses scheduled for demolition to make way for the new Taylor Institution: Jackson’s Oxford Journal on 19 October 1839 reported that the building materials of several houses nearly opposite St John’s College were to be sold by auction, including one now or late in the occupation of Mr Grimsley, sculptor. In December 1839 Grimsley was working for New College, restoring their exterior stone carving, and he replaced the figure of St Michael that stands on the east gable of New College Chapel. He may also have carved the niche in the north-west corner of the President’s garden in Trinity College that holds the original New College figure. Under the heading of Officers of the Oxfordshire Architectural & Historical Society in their rule book of 1840, Thomas Grimsley is listed as “modeller”. In that year he restored the east window of the chapel at the east end of the south aisle of St Giles’s Church (later the vestry). At the time of the 1841 census the Grimsley family was living at Parker’s Square in St Giles: this appears to be an area off the north-east end of St Giles’s Street, possibly near Black Hall, the home of the bookshop owner Joseph Parker. Grimsley described himself as a sculptor, and he and his wife now had six children aged between three and sixteen. The reference for that very last bit was "OSPSGA, December 2, 1840" and a bit of research showed that this must have been the Oxford Society for Promoting the Study of Gothic Architecture. At the end of 1841, Grimsley made two stone fireplaces for Deddington House. In 1844 Grimsley executed a colossal statue of Thomas Rowney (left), carved from a block of Caen Stone weighing more than three tons, which was erected in the empty central niche (below) of the former Oxford Town Hall that was demolished in 1893. Rowney was the MP for Oxford who had contributed towards the cost of this building. 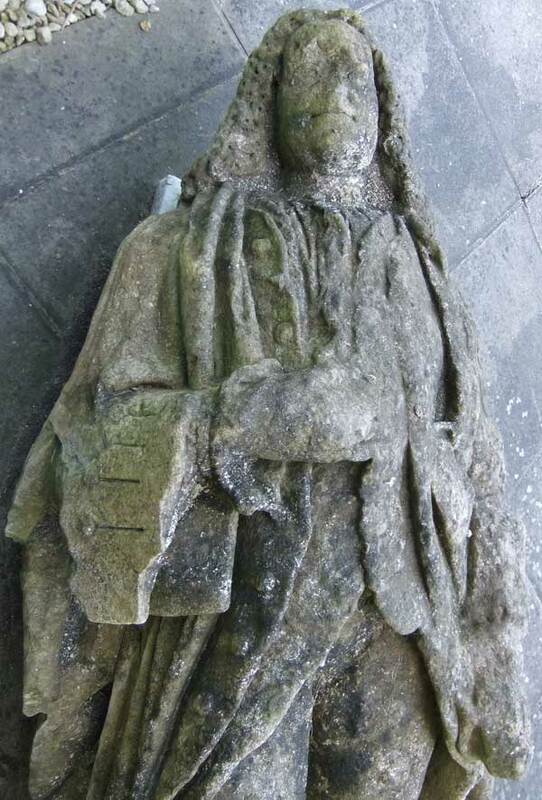 This statue was rediscovered in Oxford in 2010, and can be seen outside the Oxford History Centre in Cowley. Also in 1844 Grimsley showed at Westminster Hall a figure of Cardinal Wolsey, which the Literary Gazette considered gave “more idea of the butcher’s son than of the great Cardinal”. Grimsley has the following entry under “Stone & Marble Masons” in Hunt’s 1846 Directory: “Grimsley Thomas, 10, St. Giles’ street, and Headington” (with the entry having an asterisk indicating “also statuary”). These premises (which were demolished in 1906 to make way for the Rawlinson Building of St John’s College) were probably just his shop with workshop behind. Left: Drawing of Headington National School made by Thomas Grimsley, the architect, in 1847. This red-brick Gothic building was opened on the London Road in 1848, and stood behind the present school. Grimsley used structural terracotta rather than wood to reduce carpenters’ bills. It was in a sorry state by 1894, when most of it was demolished; the part that remained was removed in 1928. In 1846 Robert Speakman sold an entire unprepared estate of three acres of land to the east of the Banbury Road to Thomas Grimsley and Thomas Davis. On 25 January 1848 his eldest daughter Rebecca Ann Grimsley married John Cook at St Michael & All Angels Church in Summertown. Rebecca was described as being of that parish, and signed her name in the marriage register with a cross; and John was of St Peter-in-the East parish and a college cook, the son of the builder William Cook. Its applicability is not confined to schools, but well suited for workhouses, stables, barns and warehouses, both for safety against fire, strength and durability, not forgetting that from the absence of wood and carpenter’s work it is less costly by one fourth than the common mode of building. In 1850 Grimsley built St Cross School in this way: all that now remains is the porch and cemetery lodge (now part of St Cross College), and here new tiles have been laid on top of Grimsley’s. At the time of the 1851 census, the Grimsley family was probably at the same address in Parker’s Square, although it was now described as Parks, St Giles. Grimsley was now a master sculptor employing eleven men. The five youngest children were still at home, and his son Henry (19) was now described as a journeyman sculptor. The eldest daughter, Rebecca, was living at 8 Blenheim Place, St Giles with her husband John Cook (who was cook at Jesus College) and their daughters Rebecca (born 1848/9) and Maria (born 1849/50). Soon after this Rebecca’s husband, who was a debtor left her, and went to work at the Crown Inn, Scarborough: he remained an insolvent debtor, and was summoned to court on 9 February 1855. By the 1850s Grimsley was also producing terracotta gravestones, and a number can be seen in St Sepulchre’s Cemetery. 105. GRIMSLEY, HENRY, Oxford — Designer and Modeller. Terra-cotta statue of a female figure holding a dial, made in clay obtained from Shotover Hill, near Oxford. Clay, sand, and ochre, from the same place, showing fourteen different strata, to the depth of 25 feet. Grimsley had a correspondence with William Henry Fox Talbot in 1854/5. Right: Nos. 22 to 30 St Giles’s Street, running from right to left. Grimsley’s house is the lower one in the middle (No. 27). While upon the subject of drainage, it may not be out of place to allude to the establishment of Mr. Grimsley in St. Giles’s Street, where may be seen in operation the manufacture of a tube for drains, the construction of which is new in principle (it is believed), and which has been so highly approved by all who have adopted it, that it is now coming into very general use. The material is the substance known as terra cotta, possessing great solidity and comparative lightness, with extreme durability. The tube is composed of pieces of nearly a foot in length, and scarcely the thickness of an ordinary brick; and each of these pieces forms a segment of a circle on its under side, while one piece is connected with another at the sides on a principle resembling that of the mortice and tenon joint, the interstices being filled in with some kind of cement. The tube thus formed is capable of resisting almost any degree of pressure, and its capabilities altogether as a cheap and useful drain appear of a very superior character, and such as house proprietors might advantageously avail themselves of in improving their property. Terra Cotta Manufactory, St. GILES’S, OXFORD. on Tuesday, 8th June, at 11 o’clock (by direction of Mr. Grimsley, who is removing from the premises. Catalogues may be had at the offices of the Auctioneers, 8, High Street, and Littlegate, Oxford. 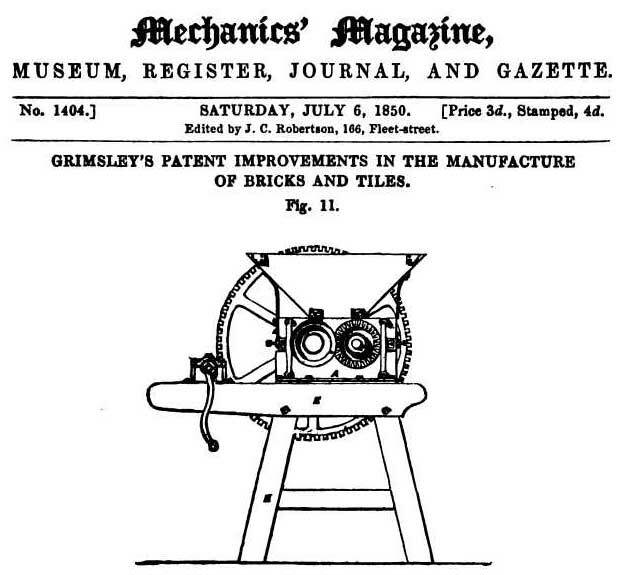 MR. GRIMSLEY, a sculptor, of Oxford, has patented improved machinery for the manufacture of Bricks, Tiles, Pipes, and Pottery; the first part of which consists of a mill for grinding or pugging the clay, and crushing any stones or foreign matter that may be mixed with it, in order to render the clay more plastic. The top and bottom of the mill are composed of two fluted conical surfaces, the top cone being inverted; both the upper and under surfaces are free to revolve round a central shaft. Between the top and bottom surfaces and equidistant from them, he mounts one or more fluted conical rollers, which are free to revolve around their axes only. Motion being communicated to either of the surfaces, or to one of the conical rollers, all the rollers are caused to revolve round their axes, and to impart rotary motion to the top and bottom surfaces in a contrary direction. When the top and bottom plates are used, the top surface has apertures to admit the clay, which is fed in through the top frame of the mill, while the under surface has also apertures or perforations through which the clay is pressed by the conical rollers into a receiving-box under the mill, in which there is a scraper or coulter revolving, which presses the clay out of the bottom chamber into the moulds, or through dies fixed at each end of the press, either horizontally or vertically. Or he dispenses with the upper surface, and makes the lower one a fixture, the conical fluted rollers turning upon shafts projecting from a central main shaft, and revolving with it, the clay being pressed through perforations made between the flutes of the under surface. When the clay has been received into the receiving -box, it is pressed by another part of the machinery into moulds, as before described; and as soon as the pressure has been applied by a piston or pistons, a cam or eccentric motion causes the front of the mould first to recede and then to rise up, when the piston further advances, and presses the brick or other article out upon a travelling-bed, which presents itself to the front of the mould, while a wire or other cutter is brought between the brick or other moulded article, and the back of the mould or piston, and thus clears the one from the other. 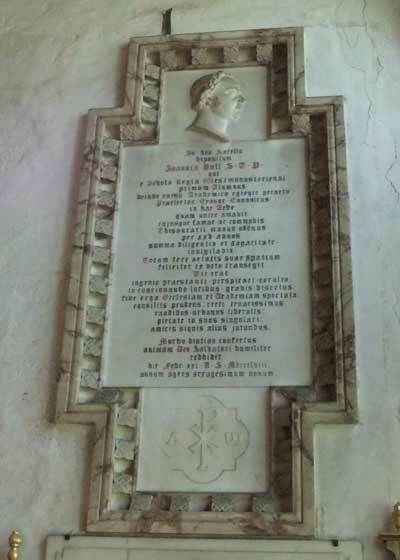 Grimsley sculpted a wall tablet and marble memorial in St Mary the Virgin Church, Witney to Edward Augustine Batt, who died in 1853. This depicted the Good Samaritan. The figures of the angels were moulded by Mr. Grimsley sen., but the execution of the work was fulfilled by his son, and reflects infinite credit on him. The monument differs materially from those ordinarily executed, inasmuch as it is a happy combination of architecture and sculpture carried out in a manner as to justify its occupying a high position as a work of art. He also spoke in high terms of Mr. Grimsley’s qualifications, not only for the perfection to which he had brought his machinery for the manufacture of tile and brick, but also for the talent which he displayed as a sculptor. He had just had a series of heads made in tile, for which, if he had had them carved in stone, he would have had to pay at least 14 guineas each: Mr. Grimsley had produced them in his hard-burnt clay, which is equally durable with stone, for 3 guineas, and yet there were no two alike. He also observed, that the irregularity of outline, which was constantly complained of as an objection to the use of burnt clay, he considered to be of no disadvantage: he would even go so far as to say that he believed that our artists of old expressly avoided the straight formal lines, and that the irregular outline afforded beauty to the work. On 22 June 1857 Thomas Grimsley was elected a member of the Oxford Architectural Society, and on 30 March 1860 Grimsley was elected an Overseer for St Giles’s parish. The 1861 census shows Thomas and Rebecca Grimsley at 27 St Giles’s Street, with their five youngest children still unmarried and at home. Thomas and his sons Henry (28) and Frederick (22) are all described as sculptors, but the enumerator has added “Statuary” next to Thomas and Henry. Their eldest daughter Mrs Rebecca Cook was now also living in a separate house in St Giles’s Street with her two daughters. Mr. Grimsley of Oxford is, we believe, also a successful manufacturer of tiles, as well as of terra-cotta headstones for graves, if that is not a misnomer; some of the patterns we have seen of his manufacture have been very good. The only objection that we have to the use of terra-cotta for such a purpose is the liability to have the same pattern too frequently repeated in the same churchyard; but this might be avoided with proper care, and where economy is an object, terra-cotta cast in a mould is much cheaper than carved stone, and equally durable if properly burnt. Jackson’s Oxford Journal of 26 October 1861 reported that Thomas Grimsley had carved a marble tablet with a medallion in memory of Dr Bull, Canon of Christ Church, that had been installed in the Latin Chapel of the Cathedral (left). On 14 August 1869 at St Giles's Church, Oxford, Frederick Grimsley married Sarah Haines Jacob, daughter of Henry Jacob, a magistrates’ clerk of St Giles’s parish, and their marriage was announced in Jackson’s Oxford Journal. On 15 November 1870 at St Giles's Church, Oxford, Mary Lydia Grimsley married James Oldham, a chemist of Hull. A poll book shows that Grimsley was still living in St Giles’s Street in 1868, but by the time of the 1871 census he was living at 8 Park Villas at the south end of the Banbury Road with his wife and their three unmarried children Henry (38), Clementina (33), and Sarah (30). Both Thomas and Henry described themselves as sculptors, and another hand added “& statuary employing 5 men”. These villas were just to the north of the present Old Parsonage Hotel (now numbered 3 Banbury Road), and in 1871 there were no houses between No. 9 Park Villas and Gee’s nursery. † Thomas Grimsley died (with his age at death given as 75) at 8 Park Villas in St Giles’s Road east (the south end of the Banbury Road) on 9 May 1875, and since his burial on 13 May was recorded in the parish register of St Giles’s Church, he was almost certainly buried at St Sepulchre’s Cemetery. † Mrs Rebecca Grimsley, née Stockford died at the age of 83 at 8 Park Villas on 29 July 1879, and her burial on 1 August was recorded in St Giles’s parish register. She would probably have been buried with her husband. At the time of the 1881 census three of their unmarried children were living together at 7 North Parade: Henry (50), who was still working as a sculptor, and Clementina (46) and Susanna Sarah (40), who had no occupation. Clementina died at the age of 60 in the Kingston district (reg. first quarter of 1894). Henry and Frederick Grimsley continued working as sculptors, but appear to have concentrated on gravestones and small monuments rather than architectural work. Their company was the Oxford Artistic Monumental and Terra Cotta Company Ltd, and their office and works were in Walton Street. By 1880 the Managing Director was Windett Woods, and all orders were sent to him at the Walton Street address. Frederick Grimsley (born 1837/8) was the Sculptor, Chief Designer, and Supervisor of Modellers and Terra Cotta branch. In the County Court of Oxfordshire, holden at Oxford. In the Matter of Proceedings for Liquidation by Arrangement of Composition with Creditors, instituted by Henry Samuel Grimsley and Frederick Grimsley, trading as H. and F. Grimsley, of No. 7½, Park-villas, Saint Giles, in the city of Oxford, Sculptors. NOTICE is hereby given, that a First General Meeting of the creditors of the above-named persons has been summoned to be held at Saint Michael’s-chambers, Ship-street, in the city of Oxford, on the 3th day of July, 1990, at twelve o’clock at noon precisely. Dated this 26th day of June, 1880. J. J. BICKERTON, Saint Michael’s-chambers, Ship-street, Oxford, Solicitor for the said Debtors. CHURCH & MONUMENTAL WORK, in MARBLE, STONE, & GRANITE. Brass and Marble Tablets, Vein and Coloured Marble Chimney Pieces, &c., &c.
THE OXFORD TERRA-COTTA MANUFACTURING COMPANY (LIMITED) was registered on the 8th ult., with a capital of £1,000, in 10s. shares, to carry on the business of monumental and artistic sculptors, modellers, &c. The subscribers are:— J. Whichello, butcher, Brill, Bucks; W. W. Woods, Reading; H. S Grimsley, sculptor, Reading; F. Grimsley, sculptor, Reading; C. Grimsley, spinster, Reading; S. S. Grimsley, spinster, Reading; and G. Woods, Wokingham, Berks. Mr. Wm. Windett Woods is appointed sole director. The last advertisement for the company appeared in Jackson’s Oxford Journal appeared on 13 February 1886. That the Company be wound up voluntarily, under the provisions of the Companies Acts, 1862 to 1886, and that William Windett Woods, of 68, St James-road, Tunbridge Wells, be and is hereby appointed Liquidator for the purpose of such winding up. Henry Samuel Grimsley evidently moved to the London area once the company was wound up, and he died of bronchitis and pneumonia at the age of 58 at 5 Rojack Road, Sydenham on 5 September 1889. His sister Clementina was present at his death, and he may have lived with her. His brother Frederick Grimsley remained in Oxford. Mildred Sarah Grimsley (born at 4 St Bernard's Road, Oxford in about March 1877 and baptised at Ss Philip & James's Church on 15 June; died at that address aged eleven months in 1878 (burial on 4 April recorded in the parish registers of both Ss Philip & James and St Giles). At the time of the 1871 census Frederick and his family were living at 28 St Giles’s Street, but by 1877 they had moved to the north side of St Bernard’s Road (then called St John’s Road). They were still at that address in 1881. Frederick presumably retired when his company was wound up in 1888, and he was the only one of the six Grimsley children to remain in Oxford. Frederick Grimsley died of cerebral apoplexy at 18 Magdalen Road in east Oxford at the age of 59 on 6 September 1896 and was buried at Cowley St John Church on 9 September. At the time of the 1901 census his widow Sarah was living at 18 Magdalen Road in east Oxford with her son Frederick Thomas Henry George Grimsley, who was described as a fine-art dealer; her widowed sister Mary H. Brown; and her unmarried niece Helen R. Cook. Sarah and her son were both still there in 1911, but Frederick was now the head of the family and a shop assistant, and his only surviving sibling Edith Grimsley (40), who had been living with her aunt Mrs Mary Oldham up in Hull, had moved back in with them. Mrs Sarah Haines Grimsley died there at the age of 81 on 31 March 1916 and buried with her husband on 4 April: her daughter Edith was present at the death. † Frederick Thomas Henry George Grimsley died at 8 Hayfield Road at the age of 63 on 28 February 1938, and the St Giles’s burial register specifically states that he was buried in St Sepulchre’s Cemetery on 3 March. As the cemetery was no longer open to new burials, he would have been buried in an existing grave, probably that of his grandparents. His sister Edith was his sole executor, and his wealth at death was £197 7s. 9d. Edith Mary Grimsley continued to live at 8 Hayfield Road and died there on 16 September 1953 at the age of 82. The St Margaret’s Church burial register is unavailable, and she is not listed in that of St Giles’s. She may have been buried elsewhere, or cremated. Mrs Rebecca Ann Cook, née Grimsley (born 1824/5) and her husband John Cook had three daughters, all born at Blenheim Place, Oxford and baptised at St Giles’s Church on the dates shown: Rebecca Mary Eliza Cook (5 January 1849). who died in 1860; Maria Ann Cook (30 January 1850); and Ellen or Helen Rosa Cook (27 August 1851). 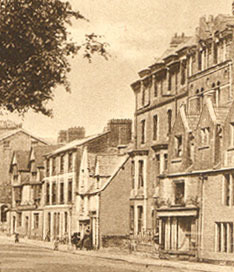 At the time of the 1851 census the family was living at 12 Blenheim Place, but by the time of the next census in 1861 it appears that Rebecca and her husband had split up, because she and her daughters Rebecca and Ellen were living at St Giles’s Street, and although married, she described herself as the head of the household; meanwhile her husband was staying with his two unmarried sisters at 18 Longwall Street, Oxford. In 1871 Rebecca (44), who now described herself as a widow, was living in North Parade Avenue with the same two daughters; and in 1881 she was lodging at the south end of the Woodstock Road with Ellen (26). By 1891 she had moved with her two daughters to live with her unmarried sisters Clementina and Sarah at 5 Harley Road, Willesden, Middlesex, and described herself as single. Rebecca’s home was at 5 Robert Street, Lambeth and she was working as a charwoman when she died of heart disease on 7 September 1898 at the age of 72 in the Brook Street Workhouse Infirmary in Lambeth. Mrs Mary Lydia Oldham née Grimsley (born 1828/9) was living with her husband James (72), who was still working as a chemist and druggist, and her niece Edith M. Grimsley (Frederick’s daughter) at 167 Anlaby Road, Hull at the time of the 1891 census. James Oldham died at 18 Coltman Street, Hull on 5 April 1909 at the age of 67 and his effects came to £3,166 19s. 5d. The following month his wife also died there, at the age of 80 on 28 May 1909, and her niece Edith was in attendance. Miss Clementina Grimsley (born 1833) was living at 5 Harley Road in Willesden in 1891. She was the head of the household, and living with her were her sisters Sarah Grimsley and Mrs Rebecca Cook, and Rebecca’s two daughters:all were described as living on their own means. Clementina died of breast cancer at 3 Windsor Road, Teddington (in the Kingston registration district) at the age 60 on 21 February 1894. Her niece Helen Rosa Cook, who was present at the death, was the informant. Miss Susannah Sarah Grimsley, known as Sarah (born 1835) probably lived with Clementina until the latter died in 1894. Sarah herself died in the Kingston Union Workhouse Infirmary at the age of 74 on 2 October 1903.